Humans and elephants don’t always get along. In Africa and Asia, elephants damage infrastructure, farmers’ crops, and natural habitat critical for other species. If an elephant becomes a problem, humans may kill it. So local people and conservationists are trying to find better ways to keep elephants away from sensitive places. Now, researchers think they have a good tool to deter elephants: honeybee pheromones. “Elephants deplore being stung in the trunk, it’s an extremely sensitive organ. Imagine being stung in your nose by a bee, and multiply that a few thousand times.” Mark Wright, a professor of entomology at the University of Hawaii at Mānoa. Kenyan farmers have long known that if they hang live beehives around their farms, they will repel elephants. “The problem is logistically, how do you manage hundreds of thousands of hives, if you have a huge area to protect? 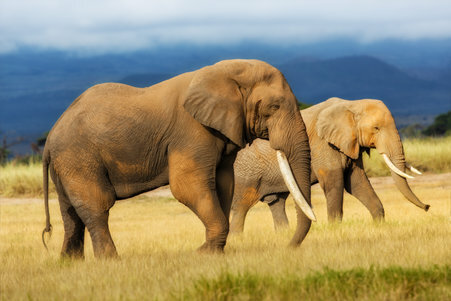 And then the idea came up to look at the alarm pheromones, which are chemicals that the bees release to launch an attack on something that’s marauding the hive.” Because elephants have a highly developed sense of smell, Wright and his team thought they might be able to use the bees’ chemical alarm signal to affect elephant behavior. Next up, the researchers plan to refine the synthetic pheromone mixture, in order to get an even stronger avoidance response from elephants. That way, these remarkable animals will stay far away from wherever they should not be going—and both elephants and humans can coexist a bit more peacefully.